One more section of tile installed. 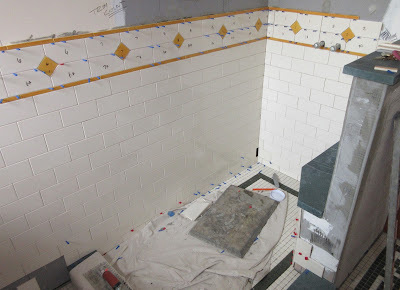 I guess our tile guy threw out his back so progress is inching along slowly (as usual). Yesterday, after no showing for 3 days, he finally came and spent some time and laid tile in the shower. Then today he sent an email he hurt his back and wouldn't be showing up today. At least he wrote me this time. Jeff and I have been sick, so we're not getting anything done either.